After a long, hard winter, cyclists are finally enjoying a taste of spring weather. All across Massachusetts, bikes are being pulled out of storage, tuned up, and taken back out on the road. Boston celebrates the return of the nation’s premier bike-sharing program, Hubway, which is celebrating its third season in town. The program has now expanded from Boston to Cambridge, Somerville and Brookline. And today, to celebrate opening day for the Red Sox, Hubway is having a Rolling Celebration ride through the cities. Roads. You can travel on the side of the road or in the middle of the lane. Up to two cyclists can ride abreast in a lane. Many communities also offer designated bike lanes and shared lanes. Turns to the left can, and should, be made from the left-most lane. Cars. Cars must give you the right of way; they cannot turn left in front of you unless it is safe to do so; they may not make a right turn in front of you if they have just passed you; they must pass at a reasonably safe distance, or wait until it is safe to do so. Sidewalks. You are allowed to ride on sidewalks outside business districts, unless prohibited by local regulations. Bike Helmets. Helmets are required for cyclists ages 16 and younger in Massachusetts, but they are also an important tool for riders of all ages. Head injuries are among the most serious injuries a cyclist can sustain in a bike accident. In 2009, 630 cyclists died in the United States and 91 percent were not wearing helmets, according to the Insurance Highway Safety Institute. Bike Lights and Reflectors. If you ride in the dark (one-half hour after sunset or one-half hour before sunrise), make sure your bike has lights and reflectors. You must have a white light facing forward and a red light facing backward. Cyclists must have reflectors on their pedals or reflective material around their ankles. You can have as many lights as you like. Bike Maps. Bike lanes and bike paths may offer safer travel options. Call your local town or city hall and ask if they produce a bike map so you can plan your route. These two are available online: Somerville Bicycle Map and the Boston Bicycle Map. Bike Parking. You are allowed to park your bike in a bike rack or anywhere on a sidewalk or road, but your bike cannot obstruct pedestrians or motor vehicle traffic. See this map for Boston Bike Parking. Bike Accidents. If you are in an accident, the most important step is to obtain medical care, even if you do not initially think you are seriously injured. If you are able, take pictures of the position of your bike and the car at the accident scene. Later, file a report with the local police department. Under the law, you must notify the police for any accident involving serious injury or over $100 or greater in property damage. Protect Yourself With Adequate Insurance. Believe it or not, insurance on your own car may protect you if you are in an accident. Your car insurance may provide uninsured or underinsured coverage for serious injuries. 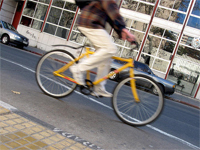 Read our article, What Every Massachusetts Bicyclist Needs to Know About Car Insurance. Your homeowner’s policy may provide coverage for property damage.